This is a German folktale about a porridge pot. It helps to understand the story if you know what porridge is. Have you ever had Cream of Wheat or Oatmeal? They are kind of like porridge. Porridge is made from bits of grain that has been added to warm or hot water and stirred up like a soup. Today we eat things like this for breakfast. Years ago, porridge was eaten for lots of meals - because it did not cost much. But, even cheap food doesn't help when you don't have the money to buy the grain to make the porridge. Once upon a time, a poor little girl lived with her mother. The two lived in a town that was so poor the people had hardly anything to eat. Instead of having time to play, each day the little girl spent most of her time out in the fields all day gleaning after the harvesters. Gleaning was hard work! She had to crawl around on her hands and knees and pick up the kernels of grain that were dropped in the dirt by the men who worked int he fields. She and several other girls got permission of the landowner to glean if they agreed to give him half of the grain they picked up off the ground. While the girls worked, they had to be mindful of birds that dove after the seeds in competing with them. It was hard work - picking up a few grains at a time, blowing off the dirt, putting the grains into your apron and all while dodging birds who were angry that the girls were taking food they wanted. After an entire morning of work in the hot, beating sun, each of the girls had picked up the last grain from the field. They gave half of the grain to the landowner, as had been their agreement. The sun was almost at noonday when the girls started back to town. On the way, they met a little old woman who sat begging for food. "Guten Tag," said the old woman, which meant good day. "Please won't you share your food with me?" The other girls turned their heads away as they passed the old woman by. But the poor little girl couldn't help but look at the old woman and drew closer. "Won't you help an old woman," she cried. Though the girl was poor and she had already given half of her earnings to the landowner, her mother had taught her to share. 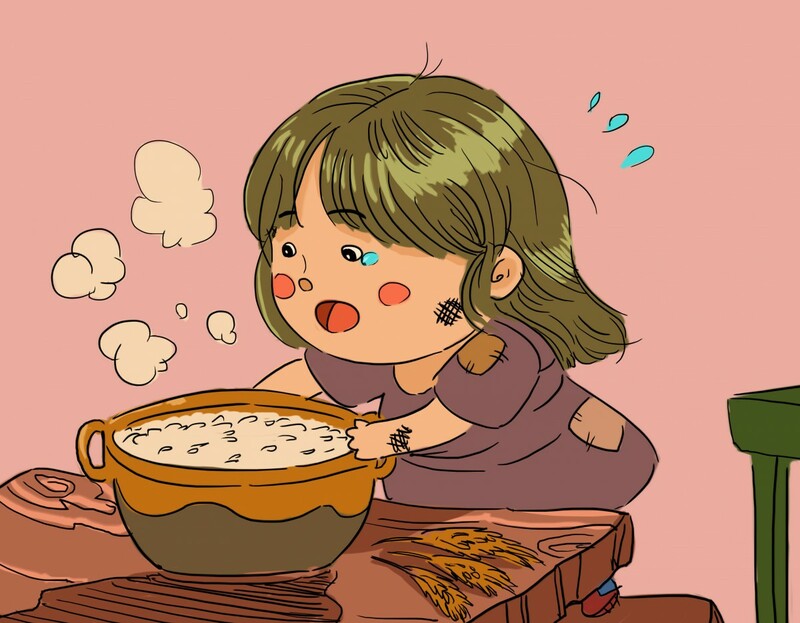 She knew that if she gave away any of the grain she still had in her apron that the porridge they would have to eat would be thin and watery and not very filling. But, how could she eat at all when she knew the old woman would be hungry. So, she divided the grain in her apron in two equal parts and gave half to the old woman, saying, "God Bless you, old woman." The old woman said, "Because you have been so kind, you must take this pot." She gave the girl a little iron cook pot that had sat behind a bush near the place where she had been begging. At first, the girl would not accept the pot. But the old woman looked hurt when she refused the gift. So she took the woman's gift and said, "Danke," which meant thank you in German. "Bitte," said the woman, which meant you're welcome. Then the old woman told her a secret. "You only need to say to it, 'Little Pot Boil! ', and it will boil sweet porridge for you. Then Say, 'Little Pot Stop' and it will stop boiling." The little girl thought the old woman was telling her a story. Yet, she still took the pot home with her. When she got home, she thought she would try the pot just in case the old woman's tale was true. "Little Pot Boil," she said. The pot immediately boiled enough porridge to last for several days. "Little Pot, Stop!" said the little girl, and it stopped! The little girl and her mother shared the porridge with the neighbors who lived on each side of them. It didn't seem right to have food when others around them were hungry. When they noticed that the families who lived in front and behind them also had no food, the little girl again said "Little Pot Boil." Once again, the pot quickly boiled enough porridge to last for several days. "Little Pot, Stop!" said the little girl. The little girl and her mother shared the porridge with the neighbors who lived in front and behind them. It wasn't good to have food when others around them were hungry. A few weeks later, while the little girl was away, visiting a friend, her mother became hungry. She had seen her daughter start the porridge pot before and said, "Little Pot Boil!" The pot immediately began boiling porridge. But, the little girl's mother had not heard that she had to command the pot to stop boiling, and so after a while, it boiled over - and over - and OVER! The porridge bubbled onto the kitchen floor. It ran out of the kitchen and slopped out the door. The porridge rolled down the streets and into everyone's house. As she walked back home, the little girl saw a great river of porridge flowing down the street. When she saw the porridge, she immediately shouted, "Little Pot Stop!" The Little Pot stopped! But, by now, all of the townspeople had to eat their way back into their houses. It was surprising, but no one complained. They weren't hungry again for months, and that was good. It's not nice to have food while everyone else is hungry.